One of the most delicious sweet crepes to make are these strawberry and raspberry crepes. It can be served for breakfast or dessert. Italian mascarpone cream cheese makes for a yummy creamy filling. Once assembled it is a show-stopper and will please anyone. Best of all, it tastes so good. What’s not to love? Berries and cream go well together in this recipe. If you haven’t tried mascarpone cream cheese, I urge you to try it. Once you’ve had it, it will be a keeper. Trader Joe’s sells it at a reasonable price of less than $4 dollars. Finding fresh berries is also key to the best crepes. I use fresh strawberries and raspberries, eggs, flour, milk, canola oil, salt, sugar and vanilla yogurt. Sometimes I like to add lemon zest to the filling mixture. It is a lot of fun to make these crepes. What’s even more fun is eating them. You can prepare the crepes hours before and keep it covered until you are ready to assemble it. The next time you are looking for an easy dessert, try making it. What a delicious combination of fresh berries and mascarpone cream. Great for breakfast or dessert. Make the filling: In a bowl mix together mascarpone, yogurt and 3 Tbsp. sugar until smooth. Cover and refrigerate. Meanwhile, make the batter: In a bowl mix flour, 1/2 tsp sugar, and salt. Add eggs, milk and oil. Whisk together until there are no lumps. Heat a 10-inch nonstick pan to medium/high. Spray pan lightly with non-stick cooking spray. Pour 1/4 cup of batter in the middle of the pan and swirl it around until all the bottom is covered but batter. Let cook for 2 minutes. Then flip it over and cook for another minute. Use a spatula to lift crepe out of the pan and transfer to a flat dish. Cover crepe with wax paper to prevent sticking and drying. Repeat process and cook each crepe. Adjust the heat to medium if crepe gets too brown. (it will cook faster as the pan gets hotter) Cover each layer with wax paper to prevent sticking. After the last crepe is cooked, cover the whole thing with plastic wrap. Make the whipped cream: Use a hand mixer or stand mixer and whisk together cold whipping cream, vanilla and 2 Tbsp powdered sugar until soft peak forms. Cover and refrigerate. Assemble crepes: Divide the filling into 5 portions. Lay 1 crepe on a flat plate. Spread filling across the middle of the crepe. Add fruit and roll crepe. Repeat process with the rest of the crepes. 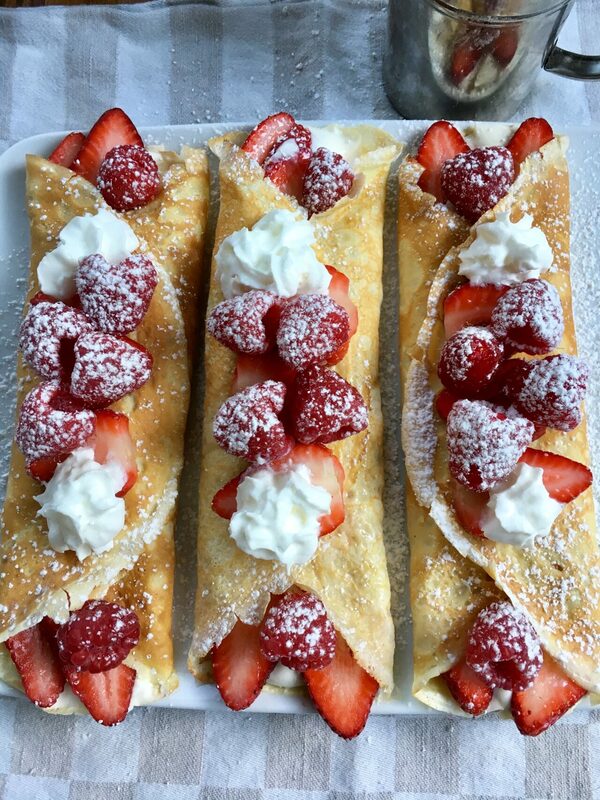 Add a few more berries on top of rolled crepe. Serve immediately with a dollop of whipped crean and dust it with powdered sugar on top.